All transactions are safe and secure with a reliable history in online purchasing behind each of our associates. Buy the Street Fighter Pulp Fiction t-shirt to own Pulp Fiction clothing and merchandise. 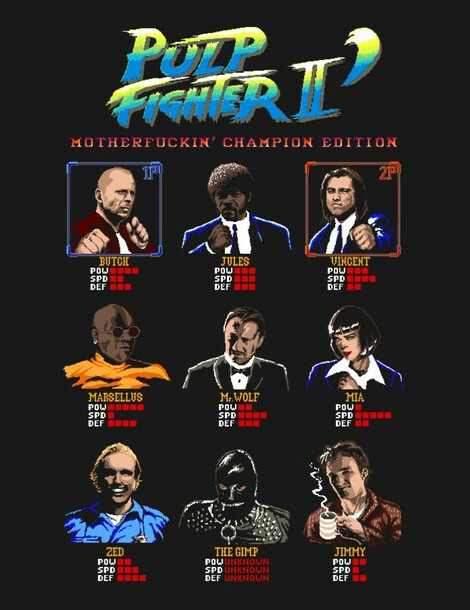 The fronts of these Street Fighter Pulp Fiction t-shirts display a video game style character selection screen that includes Vincent (John Travolta), Jules (Samuel L. Jackson), Butch (Bruce Willis), Mia (Uma Thurman) and even the Gimp. The title Pulp Fighter II, along with the edition, is displayed at the top of the design. Wear it to play video games and to recite the Pulp Fiction Ezekiel bible verse, "The path of the righteous man is beset on all sides by the inequities of the selfish and the tyranny of the evil man." In addition to the Street Fighter Pulp Fiction tee above, browse the Pulp Fiction Clothing Gallery for more apparel like men's and women's clothes, kids shirts or hoodies.